This dosa is different from other variety of dosas as there is no need of fermentation for this dosa. To prepare this dosa two main ingredients which you will need are rice and salt. 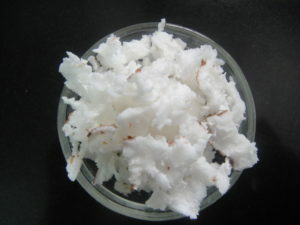 In my recipe I have added fresh coconut also, you can skip coconut, if it is not available at home. You can use any variety of rice to prepare this dosa, soak rice for at least 4 hours or overnight. Neer dosa is served with coconut chutney, sambar and also with non-vegetarian curries like chicken curry or mutton or egg masala. For more south indian dishes check Hyderabadi Bagara Baingan (Spicy Aubergine Curry) , Instant Masala Rava Idli (with coconut chutney) . 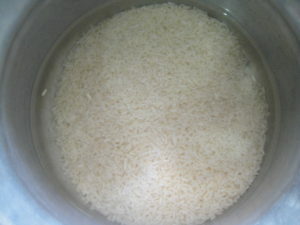 Wash and soak rice for overnight or at least for 4 hours. Grate fresh coconut before that peel brown part of the coconut. 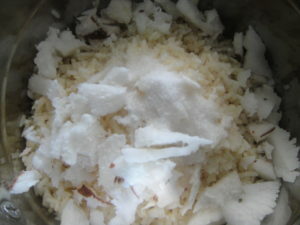 In a mixer prepare a fine paste of soaked rice, salt and grated coconut with the help of water. Keep the consistency of batter watery and thin. You need pouring consistency for perfect dosas, with right consistency you will get holes and soft dosas. Heat a non-stick tawa. Spread small amount of oil with a napkin or one half of an onion. Before spreading batter on the tawa stir it well. Every time when you prepare a new dosa stir the batter. 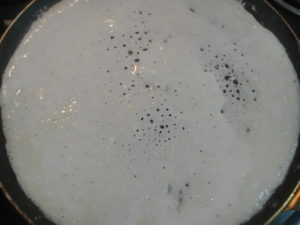 Batter of neer dosa is very watery, so you need spread batter by rotating or tilting the pan. On the corners apply oil. Let the dosa cook on it own, cover it. When done, dosa will start separating from the corners. Flip the dosa and cook for few seconds, if you wan to cook from both the sides. This step could be skipped. I flipped the dosa only to show you all the nice jali that you get with perfect consistency. Fold the dosa in triangular shape. Do not stack dosa on each other, keep them separately. Stacking them up leads to dosa sticking to each other. 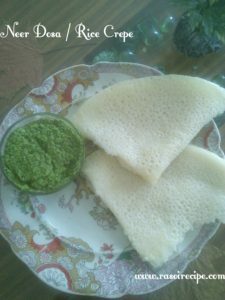 Serve neer dosa with coconut chutney. 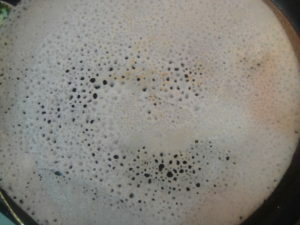 Please keep in mind that amount of water require for perfect consistency of dosa depends upon the type of rice. If water quantity is more than the required amount, you will not get any net like texture. If water quantity is less than the required amount, your dosa will start breaking when you try to fold dosa. 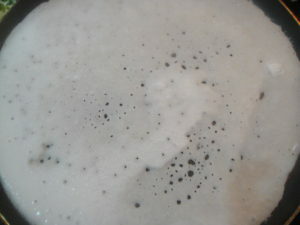 Every time when you prepare a new dosa, stir the batter well. 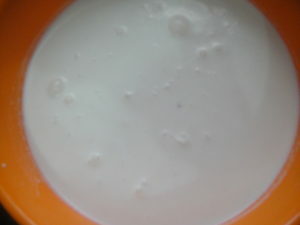 If your batter is too thin, add rice flour in the batter to get perfect consistency. I love neer dosa. Thanks for the recipe.